The glassy-winged sharpshooter (GWSS), Homalodisca vitripennis (Germar), is a xylem-feeding leafhopper native to the southeastern United States and regions of northern Mexico. 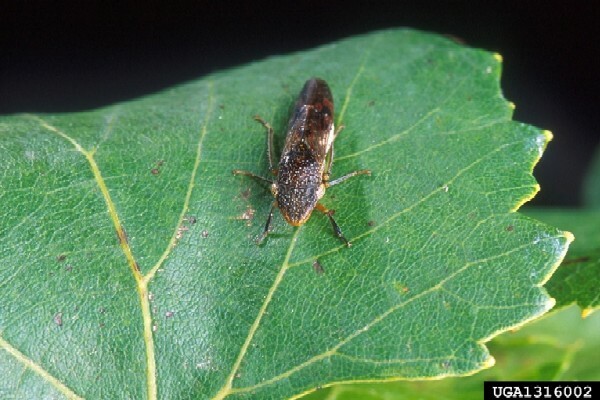 This insect is an important vector of the xylem-limited bacterium, Xylella fastidiosa. X. fastidiosa is responsible for many economically important diseases including phony peach disease, numerous leaf scold and scorch diseases, variegated citrus chlorosis and Pierce’s disease of grape. This insect has been accidently introduced to California, Arizona and a number of South Pacific islands where it threatens the grape and citrus industries. They lay their eggs inconspicuously below the epidermis of plant leaves which has allowed them to spread to new locations through the nursery trade at an alarming rate. Glassy-winged sharp shooter (Homalodisca vitripennis) adults are about 13-14mm long. They have dark brown bodies with small yellow dots on the head and thorax. The underside of the abdomen has ivory and black markings. They have large translucent smoky-brown wings with red markings. The face and legs are yellow-orange in colour, and the eyes are yellow with dark speckles. Nymphs have a similar body shape to adults but are wingless, gray and have prominent bulging eyes (PaDIL 2006). Please see PaDIL (Pests and Diseases Image Library) Species Content Page Bugs: Glassy-Winged Sharp Shooter for high quality diagnostic and overview images. The glassy-winged sharp shooter (Homalodisca vitripennis) is also referred to as Homalodisca coagulata in literature. Homalodisca vitripennis is considered a senior synonym of Tettigonia coagulata syn. nov. and therefore should be used as the scientific name for the glassy-winged sharpshooter, a major vector of the bacterial Pierce's disease of grapes, phonypeach disease, plum leaf scald, and oleander leaf scorch in southern United States and northern Mexico. Please see Takiya et al. 2006 for details. There are two generations of Homalodisca vitripennis in California per year. Females overwinter as adults and lay eggs in late-winter or early spring. The young wingless nymphs emerge from eggs after about two weeks. Nymphs undergo five molting stages before reaching maturity, during which time they feed on the stems of the host plants. They mature in late spring through summer and lay more eggs. This second generation begins to mature in summer and provides the overwintering adults for the following year (MAF n.d.). Glassy-winged sharp shooters (Homalodisca vitripennis) are native to the south-eastern part of the USA, where they are found to occur in forest margins. In their introduced range, in California, riparian woodlands in coastal and foothill areas seem to be suitable habitat. Females lay eggs on host plants below the leaf epidermis once during their two-month (can live much longer when overwintering) adult stage. Oviposition predominantly occurs at night (Tipping et al. 2005 in Mizell et al. 2008) with 10 to 12 eggs produced at a time. Egg masses vary from 3-28 dependent on past feeding history (Varela et al. 2007). Glassy-winged sharpshooters (Homalodisca vitripennis) have a vast host range of over 100 species (ornamental landscape plants, agricultural crops, and natural vegetation; they especially prefer sumac and crepe myrtle). They feed on the xylem (plant tissue that transports water and minerals from roots) of their hosts. Because xylem fluid is nutrient poor H. vitripennis displays very high consumption rates (Mizell et al. 2008). \nYoung nymphs feed on the stems of the plant on which they hatched and are known to consume up to 10 times their weight in liquids in one hour. Active stages of the insect must feed constantly to avoid starving to death as adults cannot survive for more than about 4h without food (MAF n.d.). Because xylem is so nutrient poor H. vitripennis display host switching which allows them to take advantage of differing nutrient levels between plants. They must respond quickly to changes in xylem fluid content by dispersing to find plants with the highest nutrient levels. Adult glassy-winged sharpshooters are strong fliers and can disperse great distances to search for optimal host plants (Blackmer et al. 2003 in Mizell et al. 2008). Glassy-winged sharp shooters (Homalodisca vitripennis) were probably introduced as eggs on plants. Recommended citation: Global Invasive Species Database (2019) Species profile: Homalodisca vitripennis. Downloaded from http://www.iucngisd.org/gisd/species.php?sc=240 on 22-04-2019. The glassy-winged sharpshooter is an extremely polyphagous insect, feeding on the xylem fluid of over 100 known species of plant, in at least 37 different families (Alderz, 1980 in Boucias et al. 2007). The actual feeding on plants causes little damage; it is the ability of the GWSS to vector the bacterium Xylella fastidiosa that causes devastating diseases of many plants which is a major problem (Varela et al. 2007). There are almost 150 known strains of X. fastidiosa, which may be benign or cause mild to severe disease symptoms. In grapes one of these strains causes a lethal disease known as Pierce’s disease, which is a particular problem in California vineyards as grapes are one of the most economically important crops in California (US $4.1 billion/year) (Krugner et al. 2008). Pierce’s disease has been particularly damaging to wine grapes in the Temecula Valley viticulture area, where losses have been as high as 20-30% for some vineyards (Hix 2001 in Byrne and Toscano 2007). Although the disease has been present for many years, it was easily managed because native sharpshooters were poor vectors. The arrival of GWSS, which are far more efficient vectors, has allowed the bacterium to spread much further causing damage to hundreds of hectares of vines (MAF n.d.). In California X. fastidiosa also causes oleander leaf scorch, almond leaf scorch, mulberry leaf scorch, cherry plum leaf scorch and sweet gum dieback. Outside of California other strains of the bacterium cause phony peach disease, plum leaf scald, leaf scorches in sycamore, elm, maple, and oak,and variegated citrus chlorosis (Varela et al. 2007). 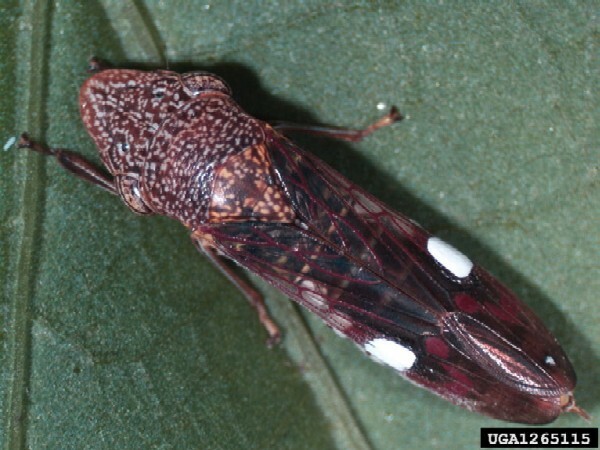 The glassy-winged sharpshooter is also a problem due to the production of large amounts of white excrement (“sharpshooter rain”) which damages cars and other surfaces (Varela et al. 2007). The current strategy for containing the problem of GWSS and the disease causing Xylella fastidiosa bacterium it transmits is to keep the insect out of new areas. In the United States tighter inspections and regulations of nursery trade in infected areas have been imposed in an attempt to slow down the rapid spread of the pest. The main chemical used to protect Xylella-susceptible plants in both commercial agriculture and urban landscapes is imidacloprid, which is registered for home and professional landscape use on nonfood crops. Parasitoid wasps are the most commonly used biocontrol agent against GWSS. Searches for parasitoid wasps have resulted in the collection of several mymarid and trichogrammatid species. In California species released include Gonatocerus ashmeadi, G. fasciatus, G. morrilli, and G. triguttatus, and most recently a strain of Anagrus epos from Minnesota (Morse et al. 2006). Research by Krugner et al. (2008) aims to determine host range and efficacy of A. epos against GWSS populations. Please follow this link for more details on the control options used for the management of the glassy-winged sharpshooter. Informations on Homalodisca vitripennis has been recorded for the following locations. Click on the name for additional informations. Biosecurity New Zealand 2008. Bio-control for Glassy-winged Sharpshooter in Cook Islands. Biosecurity New Zealand. n.d. Glassy-winged sharpshooter factsheet. Boucias, D.G., Scharf, D.W., Breaux, S.E., Purcell, D.H. & Mizell, R.E. 2007. Studies on the fungi associated with the glassy-winged sharpshooter Homalodisca coagulate with emphasis on a new species Hirsutella homalodiscae nom. prov. BioControl 52: 231-258. Castle, S.J. & Naranjo, S.E. 2008. Comparison of sampling methods for determining relative densities of Homalodisca vitripennis (Hemiptera: Cicadellidae) on citrus. Journal of Economic Entomology 101(1): 226-235. Conklin, T. & Mizell, R.F. 2004. Glassy-winged sharpshooter. University of Florida. Summary: En 2004, un programme de contr�le biologique classique contre la Cicadelle pisseuse a �t� lanc� en Polyn�sie fran�aise. Cet article pr�sente les premiers r�sultats de ce programme un an apr�s le l�cher du parasito�de en 2005. Hall, D.G. & Hunter, W.B. 2008. Populations of sharpshooters in two citrus groves in eastcentral Florida as indicated by yellow sticky card traps. Florida Entomologist 91(3): 488-490. Summary: Cet article pr�sente les premiers r�sultats du programme de lutte biologique contre la Cicadelle pisseuse en Polyn�sie fran�aise. Les r�sultats montrent que le parasito�de a rapidement colonis� toute l �le de Tahiti et que l abondance de la Cicadelle pisseuse a chut� de plus de 90%. Hunnicutt, L.E., Mozoruk, J., Hunter, W.B., Crosslin, J.M., Cave, R.D. & Powell, C.A. 2008. Prevalence and natural host range of Homalodisca coagulata virus-1 (HoCV-1). Archives of Virology 153: 61-67. Introduced Species Summary Project., 2002. Glassy-winged Sharpshooter, Xylophagous Leafhopper. Andria Cimino and Edited by James A. Danoff-Burg, Columbia University (February 2002). Summary: Report on taxonomy, description, distribution, mode of introduction, effects of introduction, and control methods. Kanga, L.H.B., Jones, W.A., Humber, R.A. & Boyd, D.W. 2004. Fungal pathogens of the glassy-winged sharpshooter Homalodisca coagulata (Homoptera: Cicadellidae). Florida Entomologist 87(2): 225-228. Krugner, R., Johnson, M.W., Groves, R.L. & Morse, J.G. 2008. Host specificity of Anagrus epos: a potential biological control agent of Homalodisca vitripennis. BioControl 53: 439-449. Lauziere, I. & Elzen, G. 2007. Effect of formulated insecticides on Homalodisca vitripennis (Germar) (Hemiptera: Cicadellidae) and its parasitoid Gonatocerus ashmeadi girault (Hymenoptera: Mymaridae). Journal of Entomological Science 42(1): 11-19. Summary: Site internet sur la lutte biologique contre la Cicadelle pisseuse en Polyn�sie fran�aise. Ce site contient de nombreuses informations et des articles en t�l�chargement. Miller, T.A. 2007. Applying insect transgenic technology: scientific and regulatory experiences. Entomological Research 37: 67-75. Morse, J.G., Morgan, D.J.W., Lytle, J.M. 2006. Seasonal population dynamics of glassy-winged sharpshooter egg parasitoids: variability across sites and host plants. In: Esser T, Tariq MA, Medeiros R, Mochel M, Veling S (eds) Proceedings, 2006 Pierce�s disease research symposium, San Diego, CA, 27�29 November 2006. Copeland Printing, Sacramento, CA, pp 92�94. Summary: Les conclusions de cet article sugg�rent que 1) l abondance de la Cicadelle pisseuse est fortement corr�l�e au niveau d urbanisation, (2) la cicadelle pisseuse peut montrer un effet Allee pendant la phase la plus pr�coce de l invasion, et (3) la dynamique d invasion est marqu�e par les moyens de d�placements humains, rapides et sur de longues distances. Ramirez, J.L., Perring, T.M. & Miller, T.A. 2008. Fate of a genetically modified bacterium in foregut of glassy-winged sharpshooter (Hemiptera: Cicadellidae). Journal of Economic Entomology 101(5): 1519-1525. Sisterson, M.S., Yacoub, R., Montez, G., Grafton-Cardwell, E.E. & Groves, R.L. 2008. Distribution and management of citrus in California: implications for management of glassy-singed sharpshooter. University of California, Riverside. The Glassy-Winged Sharpshooter . Summary: Report on distribution in California, description, biology, details about Pierce s disease and it s spread, and potential management plans. University of California., undated. Integrated Pest Mangement of the Glassy-winged Sharpshooter and the Diseases it Transmits: Frequently Asked Questions. University of California Glassy-winged Sharpshooter Workgroup. Summary: Reports on description, effects of introduction, distribution, habitat, biological management, description of and spread of Pierce s Disease, and management of spread. Varela, L.G., Hashim-Buckey, J.M. & Phillips, P.A. 2007. Glassy-winged sharpshooter. Pest Notes Publication 7492. University of California Agriculture and Natural Resources. Walker, K. 2006. Glassy-Winged Sharp Shooter (Homalodisca vitripennis) Pest and Diseases Image Library. Updated on 10/08/2006 10:05:58 AM. European and Mediterranean Plant Protection Organization (EPPO), 2002. Homalodisca coagulata. European and Mediterranean Plant Protection Organization. (July, 2002). Summary: Report on description, biology, and effects on California s grapevines and other crops. Grandgirard, J., Hoddle, M.S., Petit, J., Roderick, G.K. & Davies, N. 2007. Classical biological control of the glassy-winged sharpshooter, Homalodisca vitripennis, by the egg parasitoid Gonatocerus ashmeadi in the Society Marquesas and the Austral archipelagos of French Polynesia. Biological Control 48: 155-163. Mizell, R.F., Tipping, C., Andersen, P.C., Brodbeck, B.V., Hunter, W.B. & Northfield, T. 2008. Behavioral model for Homalodisca vitripennis (Hemiptera: Cicadellidae): optimization of host plant utilization and management implications. Environmental Entomology 37(5): 1049-1062. Specialist of biological control against alien invasive species and agricultural pests with particular interest in behavioral ecology of parasitoids, tritrophic interactions, integrated pest management. In charge of the classical biological control of the glassy-winged sharpshooter Homalodisca vitripennis in French Polynesia.